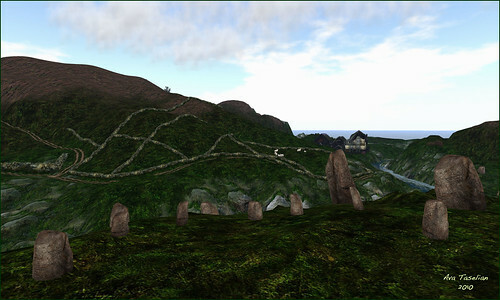 Therefore, I searched out a great (and very green) sim and landed on Empress & Heirophant sim (the slurl in the viewer also called it Inis Caiseal). The detail and downright beauty of this sim is worth the effort to visit it. There was very little lag and the worth driving your graphics up to the max to get the full effect. Even at mid-level graphics it’s still impressive. And the sheep were a nice touch (particularly the singing ones!). Week 4 of the 52 Weeks of Color challenge is upon me! Not a big fan of purple so I had to go buy a new shirt…and find some shoes. Blue as in eyes rather than sad. Second week of 52 Weeks of Color Challenge completed! Woot! Subscribe to the Urban Elf!